Lithium Polymer rechargeable battery (for DARwIn only). PCM is incorporated to protect the battery from overcharge or discharge due to excessive current. Cannot be used for Bioloids because the connector size is different. Battery cover and extension cables are not included. Can be charged with the LBC-10 Battery Charger. ** Cannot be charged via DARwIn and needs to be charged using the LBC-10 charger. Do not drop or modify parts of the battery. Do not fold the end of the sutured portion of the battery. Do not use damaged batteries that appear inflated, deformed, damaged, etc. The battery will not charge when connected to the robot. Do not store in wet or hot places. 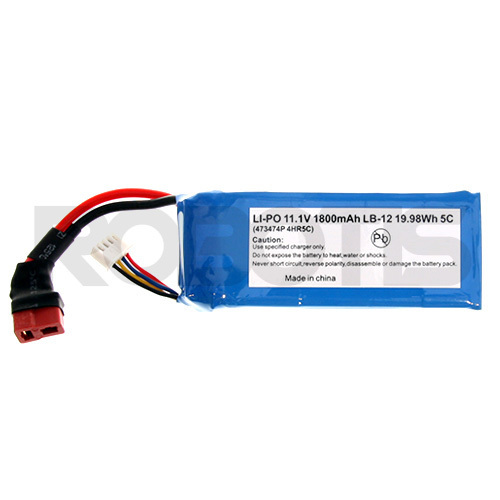 ** LIPO Battery 11.1V 1800mAh LB-012 has a warranty period of 6 months. ** NOT compatible with the CM-Series controllers.